What is risk-based asset maintenance? Risk-based maintenance (RBM) prioritizes maintenance resources toward assets that carry the most risk if they were to fail. It is a methodology for determining the most economical use of maintenance resources. This is done so that the maintenance effort across a facility is optimized to minimize any risk of a failure. The maintenance type and frequency are prioritized based on the risk of failure. Assets that have a greater risk and consequence of failure are maintained and monitored more frequently. Assets that carry a lower risk are subjected to less stringent maintenance programs. Implementing a risk-based maintenance process means that the total risk of failure is minimized across the facility in the most economical way. The monitoring and maintenance programs for high risk assets are typically condition-based maintenance programs. Risk-based maintenance is a suitable strategy for any maintenance plan. As a methodology, it provides a systematic approach to determine the most appropriate asset maintenance plans. Upon implementation of these maintenance plans, the risk of asset failure will be low. The risk-based maintenance framework is applied to each system in a facility. A system, for example, may be a high-pressure vessel. That system will have neighbouring systems that pass fluid to and from the vessel. The likely failure modes of the system are first determined. 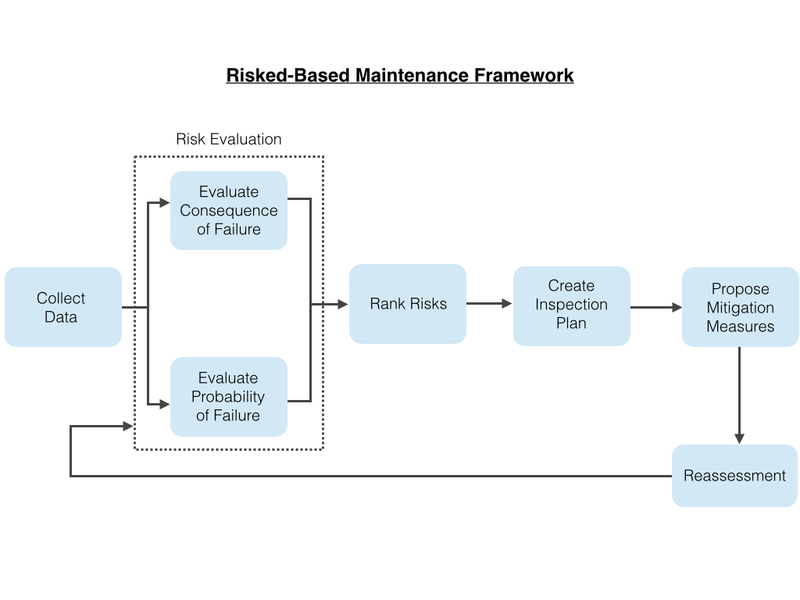 Then, a typical risk-based maintenance framework is applied to each risk. The framework is shown in the diagram. For each identified risk, data needs to be collected. This includes information about the risk, its general consequences and the general methods used to mitigate and predict the risk. At the risk evaluation stage, both the probability of the risk and the consequence of the risk are quantified in the context of the facility under consideration. With the risk evaluation complete, the probability and consequence are combined to determine the total risk. This total risk is ranked against pre-determined levels of risk. As a result, the risk is either acceptable or unacceptable. If the risk is unacceptable, a plan to inspect the system using a condition monitoring approach is determined. Or, if it is more cost appropriate, and technically feasible a preventative maintenance program might be selected. At this stage the proposal for mitigating the risk, using the condition monitoring and maintenance approach, is prepared. Finally, the proposal is evaluated against other factors – such as legal and regulatory requirements. If the proposal’s needs are not met, then the process starts again. Otherwise, the maintenance proposal is put into place. Assessing the risk of failure is one of the most important aspects of risk based maintenance. The more accurately this is done, the better the risk based maintenance outcomes will be. There is no one standard method for assessing risk. Qualitative, semi-quantitative and quantitative approaches are used to determine the possible risks that exist. To estimate the likelihood of these risks, the methods that are used include deterministic, and probabilistic approaches. 62 different approaches to assessing risk are described in Tixier (2002). The most appropriate approach will depend on the data that is available to evaluate each risk. Arunraj, N.S. & Maiti, J., 2007. Risk-based maintenance—Techniques and applications . Journal of Hazardous Materials, 142(3), pp.653–661. Khan, F.I. & Haddara, M.M., 2003. Risk-based maintenance (RBM): a quantitative approach for maintenance/inspection scheduling and planning . Journal of Loss Prevention in the Process Industries, 16(6), pp.561–573. Sakai, S., 2010. Risk-Based Maintenance . JR East Technical Review, 17, pp.1–4. Tixier, J. et al., 2002. Review of 62 risk analysis methodologies of industrial plants . Journal of Loss Prevention in the Process Industries, 15(4), pp.291–303.